My friend Jill threw a fabulous wine tasting party this weekend. It was the perfect kick-off for fall, a gathering of friends, great food, and an impressive selection of wines. Now I don’t know a lot about wine, but I do know a thing or two about preparing food on the cheap. I wanted to challenge myself to do a super-cheap appetizer platter that tasted great – and cost less than $10. Appetizers and party food don’t have to cost a lot of money. It’s entirely possible to feed a group of people on a very limited budget. If you’re throwing a party – or are asked to bring appetizers to a gathering – try putting together a platter of food using the suggestions below. Salami: A huge package of Genoa salami (perfect on an appetizer platter with crackers and crostini) was $2.79. I only used half, so I can use the rest to make sandwiches later in the week. Cheese: I also got a super cheap and quite tasty package of spreadable cheese from ALDI. A package of six cheese wedges cost $1.29. By far, the best deal on the cheap appetizer platter was the homemade crackers. I really can’t think of a better value for your money than this recipe. A huge batch of crackers costs about 50 cents to make. I even had money left over to buy some fancy olives from the grocery store olive bar! All for a grand total of $9.98! For those who are interested, two of the favorite wines of the night were Apothetic Red 2010 and Risata Moscato d’Asti. New to Cheap Recipe Blog? Be sure to follow me on Instagram to stay up-to-date on new posts and happenings! Check out my other post on creating a cheese plate for less than $10. 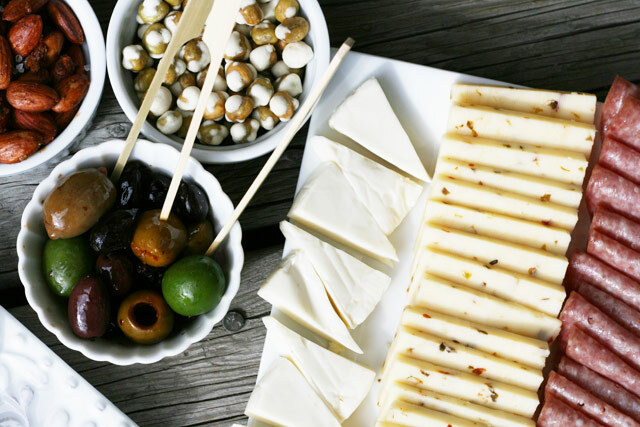 Don’t overspend when you can create a killer appetizer board for less! Announcement: Ebook (Finally) For Sale! Can I come to your party? This appetizer tray looks wonderful! I especially like the salami–so perfect for appetizers. I was stressing about serving a nice appetizer (for a small cash outlay) at a post-Christmas family gathering tomorrow – I won’t be going to multiple stores (not enough time), but I know one store close by with all of those items for a reasonable price – problem solved! Thanks so much! So glad it worked for you! I’m sure you still saved money even though you bought everything at one store. Thank you so much! I was stressing about a huge party I am having and I spent so much money on the main courses, I didn’t want to break the bank with the appetizers. So thank you so much for these great tips!